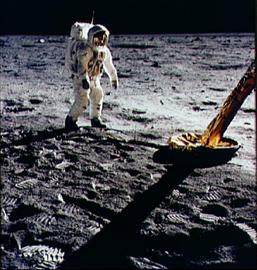 NASA scientists say that the footprints left on the moon in 1969 by astronauts Buzz Aldrin and Neil Armstrong will last in their present form for over billion years. The moon has no atmosphere or water, so it can have no wind, rain, or other precipitation. It is the effect of wind and water movement on Earth that wear down or erode features like footprints in rock. The moon receives dust and larger particles such as asteroids and meteors from space. 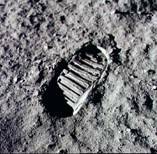 The footprints of the astronauts will not last forever because they will eventually be buried or worn by material falling on the moon. 1. If other life forms from distant stars come to the Earth’s Moon and find the astronauts’ footprints, what are some things they might conclude from studying the trackways? 2. Using either the graphs or Alexander’s formula calculate the stride distance for the walking speed achieved on the Moon. 3. How does the stride distance on the Moon compare to the stride distance for the same speed on the Earth?